Fullname: Eric Orlando Young Jr. Draft: 2003, Colorado Rockies, 30th rd. Married, wife's name is Victoria...Attended Piscataway (NJ) HS...Originally selected by the Colorado Rockies in the 30th round of the 2003 First-Year Player Draft...Signed by Mike Garlatti and Mike Ericson...Son of Eric Young, who played in the Major Leagues from 1992-2006...The Youngs are the only father/son combo ever to lead their respective league in stolen bases (Eric Young, Sr. led the National League with 53 SB in 1996). (11-for-31) during this stretch... Matched his career-high (26th time) with three hits on 8/18 at TEX; also recorded his 22nd career triple... Started the season with Triple-A Salt Lake, appearing in 84 games for the Bees, hitting .300 (92-for-307) with 18 doubles, seven triples, five home runs, 46 runs, 34 RBI, and 10 stolen bases...Led Salt Lake in triples, tied for second in stolen bases, and was third in hits. Opened 2017 season with Triple-A Salt Lake before a call-up to Angels on May 29...Hit .305 (104/341) with 15 doubles, five triples, eight home runs and 52 RBI in 83 games...Posted 20+ stolen bases for 12th time in minor leagues ... Hit .323 (20/62) with three doubles, three HR and 10 RBI in first 20 games with Angels (.323/.417/.516)...Four HR on season tied career best set in 2012 with Colorado...Hit game-tying home run in the eighth inning and walk-off RBI single in the 11th on June 13 vs. NYY. Signed as free agent with Atlanta Feb. 22, 2015...Acquired by Mets in exchange for cash Aug. 22, 2015. Spent his first full season with New York (NL), hitting .229 (64-for-280) with 10 doubles, five triples and onehome run across 100 games. Missed 22 games after being placed on the Mets' 15-day disabled list on 5/25 with a strained right ham-string. After a four-game rehabilitation stint between High-A St. Lucie and Double-A Binghamton, he was reinstated from the DL on 6/16. Collected his second-consecutive 30-steal season after swiping exactly 30 bases while being caught sixtimes (83%). The 30 stolen bases tied him for sixth-most in the National League. Hit leadoff in 53 games for the Mets, compiling a .224 (47-for-210) average, 11 extra-base hits, 18 stealsand 36 runs. Reached base in 20 straight games hitting leadoff from 4/5-26, the longest stretch by a Mets leadoff hitter since Jose Reyes reached in 33 consecutive games in 2008. Stole 12 bases over 23 games in April, the second-most by a Mets player in the month in franchise history(Jose Reyes, 17; 2007). Put together a .308 mark (8-for-26) in seven games at Turner Field, his highest average in any park (mini-mum 4 games). Totaled seven runs, eight hits, three RBI and six steals in Atlanta, his most in any visitingstadium. Scored a career-high four runs on 4/10 at Atlanta, ending the night 3-for-4 with a triple. Tied his careerhigh with three stolen bases and three hits in the same game. He became the first player in Mets historyto score four or more runs with three or more hits and at least three steals in a single game. Poked his only homer of the year on 5/12 at New York (AL), going 3-for-5 on the game and falling a tripleshort of the cycle. Stroked a career-high-tying three hits in back-to-back games for the second time in his career on 5/11 and5/12. He previously turned the trick on 8/6 and 8/7/12. Acquired from the Colorado Rockies on June 18 in exchange for righthanded pitcher Collin McHugh...Hit .251 (94-374) with, 18 doubles, four triples, one home run, 26 RBI and 38 stolen bases in 91 games for the Mets...Hit .242 (40-165) with nine doubles, three triples, one home run, six RBI and eight stolen bases in 57 games before the Rockies designated him for assignment on June 12. Became the second player in franchise history to lead the NL in stolen bases...Finished with a career-best 46 to join Jose Reyes (2005-2007) as Mets stolen base champs. Set career-high totals in most offensive categories: games, at-bats, runs, hits, doubles, triples, RBI, walks and stolen bases. Joined with his father, Eric Young, Sr., who had six seasons of 40 or more steals, to become the third father/son pair with 40 or more steals in a single season...Maury and Bump Wills and Bobby and Barry Bonds are the other two pairs. Stole 30 bases after the All-Star break, tied for the third most in franchise history...Jose Reyes stole franchise-most 34 in the second half of 2005. Drove in a career-best three on August 29 vs. Philadelphia...Finished with a career-high 32 RBI. Finished with 40 multi-hit games, 29 with the Mets, good for the fourth-most on the team. Had seven outfield assists, a career-best...Entered the year with two total. Made his Mets debut, June 19 at Atlanta...Singled once in four at-bats. Hit in a career high-tying eight straight, June 21-June 29, going 14-35 (.400) over this stretch. Stole a base in five straight games, July 4-8, one shy of the longest streak in Mets history...Vince Coleman had a six-game streak in May 1991 and Jose Reyes had two six-gamers, July 2005 and August 2007. Scored at least once in a career high-tying four consecutive games three times, last on August 31-September 3...Had done it four times previous. Hit a two-run home run (off Luis Mendoza) in the 11th inning to give the Mets a 4-2 win over Kansas City, August 2...It was Young's first career game-ending hit and first home run with the Mets. Stole his 100th base on September 14 vs. Miami in the second game of a doubleheader. Spent the entire 2012 season on the Major League roster, though he missed the final month and a half of 2012 (8/21-through end of season) with a left intercostal strain. Spent the first four months of the season as a utility outfielder and pinch-hitter...did not have more than 36 at bats in anyof the season's first four months (April-July)...saw extended playing time beginning 7/31 due to Michael Cuddyer's injuryand hit .420 (29-for-69) with 5 doubles, 3 home runs, 8 RBI and 15 runs in his final 19 games prior to the injury. From 7/31-8/19 (last game prior to injury) his 29 hits were the most in the NL during that time span and his 15 runs wereT-5th in the NL...tied a career-high with 3 hits five times, all between 7/31-8/14...had 11 multi-hit games from 7/31-8/17. Set career-high with 7 total bases 8/14 vs. MIL, going 3-for-5 with a double, home run and 2 RBI...had all 4 home runsbetween 7/8-8/15 after not homering in a MLB game since 9/8/09 (481 AB between HR). Led off game 8/8 at LAD with inside-the-park HR...was 13th inside-the-park HR in Rox history...Elias: Young's HR marksonly the 5th time in the expansion era that the first batter of a game hit an inside the park HR, and the first time inRockies history. Hit .245 (13-for-53) with 1 double, 1 home run, 4 RBI, 5 walks 12 runs as a pinch-hitter...his 13 pinch-hits were tied for2nd in the Majors...his first career pinch-hit home run came 7/8 at WAS and gave the Rockies a 4-3 win. In what was his rookie season of 2010, Eric Young Jr. played in 51 games for the Rockies, and handledthe majority of the second base playing time late in the season...Began the season at Triple-A Colorado Springs for the second consecutive season...was recalled byColorado for the first time on 4/25 and spent 20 days on the active roster before being placed on the 15-day disabled list with a stress fracture in his right tibia...was later trasferred to the 60-day DL in July before being reinstated and optioned back to Triple-A on 7/31...was again recalled from Colorado Springson 8/14 and would spend the remainder of the season on the Rockies active roster...Following his recall from Triple-A on 8/14, Young started 35 of the Rockies 47 games for the remainderof 2010, 31 of which at second base and four in left field...Finished the season batting .244 (42-for-172) with five doubles, a triple, no home runs, eight RBI and 17stolen bases in 51 games...batted .238 (15-for-63) from the right side and .248 (27-for-109) from the leftside...Played in a total of 37 games in the Minor in 2010, as he also played four rehab games at Double-ATulsa...hit .250 (34-for-136) with five doubles, a triple, a home run, nine RBI and 10 steals in the 37games...Finished second on the club with his 17 stolen bases in 2010, as only Carlos Gonzalez (26 steals) hadmore...his 17 steals were tied with Ian Desmond of Washington for the second-most of among NationalLeague rookies, and only Jose Tabata of Pittsburgh, who had 19 steals, had more steals than Youngamong NL rookies...though both Desmond and Tabata had at least 441 plate appearances, compared toYoung's 189...Young's 17 stolen bases are tied with Quinton McCraken for the second-most by a Rockies rookie in franchisehistory...he finised 10 steals shy of Dexter Fowler's 27 steals in 2009...Batted .291 (16-for-55) with runners on base, though his average dropped to .226 (7-for-31) with runnersin scoring position...Started 42 games as the Rockies leadoff hitter...batted .238 (39-for-164) in the leadoff spot...hit just .222(26-for-117) with none on base...Saw success in a limited role as a pinch-hitter, as he went 3-for-5 with a double, a triple and two walksin seven plate appearances in the pinch...Had a career-high three hits on two separate occasions, 8/20 at ARI and 8/24 vs. ATL...stole a careerhightwo bases on 8/17 at LAD...Had 12 multi-hit games in 2010, with the Rox going 9-3 in those games. Hit .289 (13-for-45) with one home runand 3 stolen bases for the Rox...made his MLBdebut 8/25 vs. LAD, going 1-for-4 as the club's leadoffhitter/center fielder; recorded his first career hit,a single off Clayton Kershaw...appeared in 5games in August (5-for-19), while Dexter Fowlerwas on the disabled list and Carlos Gonzalez wassidelined with injury (hand/thumb)...each of his first4 starts (first 5 games) were at CF, before makinghis remaining starts at second base...batted fromthe leadoff spot in all of his starts...was caughtstealing in each of his first 2 stolen base attempts,but then went 4-for-6 down the stretch; first multistealgame of career 9/10 vs. CIN featured his first,2nd career SB's...hit first career HR 9/8 vs. CIN; HRwas in his 26th career at-bat; his father didn't recordhis first MLB HR until his 99th at-bat on 9/18/92 at San Francisco - off Bud Black...with EY Jr.'s home run, he and his dad became the first father-son combintaionto hit home runs in a Rockies uniform...had 4-game hit streak 9/7-10 (.545, 6-for-11, 5 runsscored)...switch-hitter batted .304 vs. lefties and .206 vs. right-handers; hit his only HR off a lefty (PedroViola)...Young hit .299 (141-for-472) with 21 doubles, 10 triples, 7 home runs and 43 RBI in 119 games forthe Triple-A Sky Sox this season...he led all of Minor League Baseball with 118 runs scored at the time ofhis recall, after serving as the Sky Sox' primary leadoff hitter...at the time of his recall, he also ranked 7thin the minors with 58 steals...in the minors, he owned a .266 average (38-for-143) vs. lefties and a mark of.313 (103-for-329) against right-handed pitchers...split his time between 2B and CF this year (versatiledefender was used almost exclusively as an outfielder in the Arizona Fall League in 2008, while leading thecircuit in hitting (.430) and posting a league-best 20 stolen bases for Phoenix)...Young was named to boththe Futures Game and the Triple-A All-Star Game in 2009, where he batted leadoff and played second basefor Team USA, going 1-for-2 with a solo home run in St. Louis...he was also named the Pacific CoastLeague Rookie of the Year at season's end. Spent his first season at the Double-A level and hit .290 (117-for-403) with 46 steals...his 46 stolen bases were the 2nd-most on the club, and 3rd-most in the Texas League...was named to the Texas League Post-Season All-Star team as a middle infielder...finished 2nd on the club with both his 74 runs scored and his 61 walks...his .391 on-base percentage was the 3rd best mark on the club...the switch-hit- ter batted .272 (25-for-92) off left-handed pitching and .296 (92-for-311) off right-handed pitching...spent the majority of the season as Tulsa's leadoff hitter, still batted .337 (29-for-86) with runners in scoring posi- tion...collected multiple hits in 32 games, including 5 multi-hit efforts in his last 6 game played. Led all of baseball with a career-high 87 stolen bases...had 18 more stolen bagsthen the next highest player in the minors...went 87-for-118 in stolen base attempts, a Tourists record forsteals in one season...led Asheville in games played (128), runs (92), hits (142), walks (67) and tied for firstin triples (6)...named to the mid-season All-Star team...voted by Asheville fans as the "Most ValuableTourist" in 2006. Madehis pro debut at Rookie-level Casper where he was leading the Pioneer League with 14 stolen bases (in 15attempts) when his season came to an end on July 15...Eric had his jaw broken in three places when hewas hit by a pickoff throw while diving back to second base against Great Falls...underwent season-endingsurgery on July 19. April 3, 2019 OF Eric Young Jr. assigned to Tacoma Rainiers. 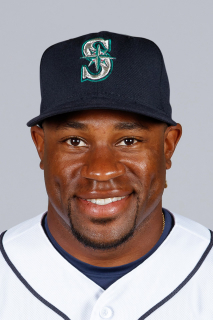 March 28, 2019 Seattle Mariners signed free agent OF Eric Young Jr. to a minor league contract. March 21, 2019 Norfolk Tides released LF Eric Young Jr..
March 21, 2019 Baltimore Orioles released LF Eric Young Jr..
February 17, 2019 LF Eric Young Jr. assigned to Norfolk Tides. February 11, 2019 Baltimore Orioles signed free agent LF Eric Young Jr. to a minor league contract and invited him to spring training. November 20, 2018 Naranjeros de Hermosillo placed OF Eric Young Jr. on the reserve list. October 29, 2018 CF Eric Young Jr. elected free agency. October 12, 2018 OF Eric Young Jr. assigned to Naranjeros de Hermosillo. July 27, 2018 Los Angeles Angels selected the contract of CF Eric Young Jr. from Salt Lake Bees. February 6, 2018 LF Eric Young Jr. assigned to Salt Lake Bees. January 8, 2018 Los Angeles Angels signed free agent LF Eric Young Jr. to a minor league contract and invited him to spring training. November 3, 2017 LF Eric Young Jr. elected free agency. August 29, 2017 Los Angeles Angels purchased contract of LF Eric Young Jr..
July 13, 2017 Los Angeles Angels sent LF Eric Young Jr. outright to Salt Lake Bees. July 13, 2017 Salt Lake Bees activated LF Eric Young Jr..
May 29, 2017 Los Angeles Angels selected the contract of LF Eric Young Jr. from Salt Lake Bees. February 2, 2017 Eric Young Jr. assigned to Salt Lake Bees. January 24, 2017 Los Angeles Angels signed free agent OF Eric Young Jr. to a minor league contract and invited him to spring training. October 11, 2016 OF Eric Young Jr. assigned to Naranjeros de Hermosillo. October 6, 2016 New York Yankees sent LF Eric Young Jr. outright to Scranton/Wilkes-Barre RailRiders. September 2, 2016 New York Yankees selected the contract of LF Eric Young Jr. from Scranton/Wilkes-Barre RailRiders. August 31, 2016 Milwaukee Brewers traded LF Eric Young Jr. to New York Yankees for cash. August 31, 2016 OF Eric Young Jr. assigned to Scranton/Wilkes-Barre RailRiders. January 12, 2016 LF Eric Young Jr. assigned to Colorado Springs Sky Sox. January 5, 2016 Milwaukee Brewers signed free agent LF Eric Young Jr. to a minor league contract and invited him to spring training. November 5, 2015 LF Eric Young Jr. elected free agency. November 2, 2015 New York Mets activated LF Eric Young Jr..
October 9, 2015 New York Mets reassigned LF Eric Young Jr. to the minor leagues. September 1, 2015 New York Mets selected the contract of LF Eric Young Jr. from Las Vegas 51s. August 23, 2015 LF Eric Young Jr. assigned to Las Vegas 51s. August 22, 2015 Atlanta Braves traded LF Eric Young Jr. to New York Mets for cash. June 11, 2015 Atlanta Braves sent CF Eric Young Jr. outright to Gwinnett Braves. June 5, 2015 Atlanta Braves designated Eric Young Jr. for assignment. May 31, 2015 CF Eric Young Jr. assigned to Gwinnett Braves. April 5, 2015 Atlanta Braves selected the contract of CF Eric Young Jr. from Gwinnett Braves. April 1, 2015 LF Eric Young Jr. assigned to Gwinnett Braves. February 13, 2015 Atlanta Braves signed free agent LF Eric Young Jr. to a minor league contract and invited him to spring training. December 2, 2014 LF Eric Young Jr. elected free agency. June 16, 2014 New York Mets activated LF Eric Young Jr. from the 15-day disabled list. June 13, 2014 New York Mets sent LF Eric Young Jr. on a rehab assignment to Binghamton Mets. June 12, 2014 New York Mets sent LF Eric Young Jr. on a rehab assignment to St. Lucie Mets. June 19, 2013 Colorado Rockies traded LF Eric Young Jr. to New York Mets for RHP Collin McHugh. June 12, 2013 Colorado Rockies designated Eric Young for assignment. October 5, 2012 Colorado Rockies designated Eric Young for assignment. October 5, 2012 Colorado Rockies activated RF Eric Young from the 15-day disabled list. May 16, 2012 Colorado Rockies activated CF Eric Young from the bereavement list. May 5, 2012 Colorado Rockies placed CF Eric Young on the bereavement list. November 8, 2011 2B Eric Young assigned to Bravos de Margarita. July 22, 2011 Colorado Rockies recalled 2B Eric Young from Colorado Springs Sky Sox. July 1, 2011 Colorado Rockies optioned Eric Young to Colorado Springs Sky Sox. May 27, 2011 Colorado Rockies recalled Eric Young from Colorado Springs Sky Sox. April 16, 2011 Eric Young roster status changed by Colorado Springs Sky Sox. April 13, 2011 Colorado Springs Sky Sox placed 2B Eric Young on the temporarily inactive list. March 27, 2011 Colorado Rockies optioned 2B Eric Young to Colorado Springs Sky Sox. August 14, 2010 Colorado Rockies recalled Eric Young from Colorado Springs Sky Sox. August 2, 2010 Colorado Rockies optioned Eric Young to Colorado Springs Sky Sox. July 24, 2010 Eric Young roster status changed by Colorado Rockies. July 19, 2010 sent 2B Eric Young on a rehab assignment to Colorado Springs Sky Sox. July 12, 2010 Colorado Rockies sent LF Eric Young on a rehab assignment to Tulsa Drillers. April 25, 2010 Colorado Rockies recalled CF Eric Young from Colorado Springs Sky Sox. March 30, 2010 Colorado Rockies optioned Eric Young to Colorado Springs Sky Sox. November 6, 2009 2B Eric Young assigned to Leones del Escogido. August 25, 2009 Colorado Rockies recalled Eric Young from Colorado Springs Sky Sox. March 16, 2009 Colorado Rockies optioned Eric Young to Colorado Springs Sky Sox. May 28, 2004 Colorado Rockies signed 2B Eric Young Jr..